Discussion in 'Prisoners of War' started by docproducer, Jan 16, 2009. My name is Emanuel and I work as a producer for a documentary film production company, based in Munich, Germany. Our work primarily concentrates on creating documentary series with a contemporary and modern historical background. as the History Channel (USA), Channel 4 (UK), SBS (Australia), Discovery Channel (USA/GB) and other stations around the world with great success. At the moment we are researching for a new documentary on the fate of the Italian vessel SS Jason alias Sebastiano Venier carrying 2000 British and Commonwealth prisoners of war. The vessel was torpedoed off the coast of Greece by the British submarine Porpoise on December 9th 1941. I would highly appreciate if anyone of you experienced forum members could help me in finding more background information, especially documents, photographs and possible eye-witnesses or their descendants. I would highly appreciate if anyone of you experienced bloggers could help me in finding more background information, especially documents, photographs and possible eye-witnesses or their descendants. there have been two books published regarding the ship. In New Zealand in the mid 1980s "No Honour No Glory" Spence Edge and Jim Henderson. The book tells of the Jason and Nino Bixio. "In the Bag" was published in South Africa. There are a few Files Covering the Incident in the U.K. National Archives War Crimes Files. I have a list of the Casualties and all the Intelligence Signals covering the Attack and the Ships movements. There was a proposal many years ago by a Greek Historian to erect a Memorial to those lost by using metal from the wreck. Not sure whether it was ever erected. My Grandfather was on the 'Jason'. He made it to Campo 52 and I have a copy on the site of his first postcard from there. He was then in Stalag 344 and eventually made his way back to South Africa. Unfortuatly he did not survive long after the war though so I can't be of any help. Thanks for posting links on the subject. My father, Eric James Gallagher, was a POW on the Jason and has vivid memories of the drama. The German engineer officer who took over after the Italian crew left, and managed to beach the vessel 40 yards from shore, is an intriguing aspect of the story. What was he doing on that ship? Why didn't he leave with the crew? Post-war inquires have apparently yielded no trace of him. His action saved more than 1,600 POWs. My Dad lives in Nelson, New Zealand. He's approaching 90. His mind and memory are in great shape. Emanuel, you may contact me directly via edwinvg(at)actrix.co.nz. thanks for your help. The infos were really useful. amazing news from all of you! I never thought I get so much info. Pleased you have been so sucessful , admit it, your real lucky break was finding this particulart forum. Italian motorship of 6,310 tons, built in Amsterdam in 1939 under the name Jason. Requisitioned by the Italian Navy and renamed Sebastiano Venier, the ship had left Benghazi harbour with around 2,000 British prisoners of war including black South African troops, New Zealanders and Australians, all captured by the Germans in North Africa. Five miles south of Navarino on the Greek Peloponnese, the ship was attacked by the British submarine HMS Porpoise. She was not flying a P.O.W. flag. Hit by a torpedo between the No.1 and No.2 hold on the starboard side, the force of the explosion hurled the heavy hatchway covers to mast height, the falling timbers killing dozens of men trying to escape from the hold. From the flooded No.1 hold only five men survived. Most of the panic stricken crew abandoned the ship taking all the lifeboats. The Italian hospital ship Arno appeared on the scene but ploughed its way through the men struggling in the water and kept on sailing, its priority being the rescue of the crew of a German ship sunk nearby. A total of 320 lives were lost among them 309 British P.O.W.s, including 45 New Zealanders. Eleven Italian soldiers also died. The ship did not sink but managed to reach the shore at Point Methoni near Pilos where it was beached. All prisoners who managed to reach the shore were confronted by hundreds of Italian occupation troops and were taken to a makeshift camp where during the next few months many died from frostbite and disease. In May, 1942, the prisoners were transferred to Campo 85 at Tuturano in Italy. Checking against a List provided by CWGC Records a few years ago George's figures are a little high. In 1980 a Radio New Zealand program featured two survivors of the Sebastiano Venier who gave a full version of the attack on the ship. Spence Edge and Bill Alley. It was said that when the ship was reversed over the shoal and onto the rocks they ventured towards a large gash in decking towards the Bows. Through this they described how they saw a long pile 6' high of Coloured South African Casualties. Although my list does contain many South African Casualties none appear to have the relevent prefix to their Service No. to indicate they were what was known at that time as "Cape Coloured" or "Native" members of the South African Forces. Perhaps the official figures given do not take into account this group of casualties. there is at least one more survivor from the ship living in New Zealand. Jim Painter who lives at Foxton. Regarding what has been said about the ship not being marked as carrying P.O.W. - The Red Cross over a number of years came up with various schemes to mark ships carrying P.O.W. All these appear to have been accepted by the Axis,but at no time did we agree to any of them. 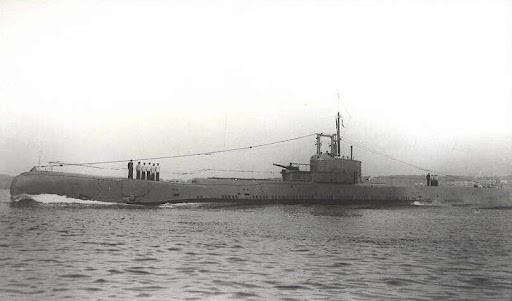 Picture of HMS Porpoise from (Janes Submarines) only 6 class porpoise subs built, HMS Porpoise was last sub to be sank in ww2, 16 Jan 1945. Trojan They dont like it up 'em! My grandfather was also aboard the Jason as a South African POW captured at Torbruk , and I am named after the ship. I have a lot of research into my grandfather's story including his journey from North Africa to Germany, via Italy and subsequently on the 'Long Marches' from Stalag VIIIB into Germany as the Allies closed in. Happy to share all the info I have, please PM me for details. Did your Grandfather ever mention Bernie Friedlander who I believe received an award(George Cross?) for the part he played in getting a rope ashore from the ship. This was presented by George V1 in 1946-47 . Unfortunately my grandfather died before I was born and so the only details I have are via my father and they just outlined the incident enough for me to further my research over the last few years. I have read about the man you mention in a couple of accounts but that is all I'm afraid. A Family (Eason) relation (Fathers Grandfathers brother?) died on this boat. I only found this info out a few months ago, on the web & that there was a book about it. The book is in our Libary, but you have to ask for it. If you want I can get another copy somewhere, or photocopy it for you. I have found a member of Ponto Williamsons family, he died a few years ago but they are very interested in the family history. A friend has a British flag that Ponto brought back from the war, its from a boat involved with the Hood/Bismark fight/sinking. I met Ponto Williamson during a Visit to New Zealand. In fact he took both myself and my Wife out for Christmas Dinner at Papakura R.S.L. Is the Library you refer to the Defence Librarary in Wellington.If so you will find a copy of "No Honour No Glory"by Spence Edge and Jim Henderson and one of "In the Bag" which I donated many years ago. Both give a very good account of the incident. The Army Museum has a list of New Zealanders lost on the Jason,Nino Bixio, Chakdina,and the Scillin that I compiled in the 1990s. There is also a wealth of information in the A.T. Library. There is a Commonwealth War Graves Commission headstone in Romanos Church cemetery, on the coast a few miles north of Pylos, close to where the Jason was torpedoed. The headstone marks the grave of a Commonwealth solider whose body was washed up close to Romanos in December 1941. My sister moved from the UK to live in Romanos in 1987. The local people told her about the body washed up on the local beach during the war. We obtained a statement from three local men who who assisted in moving and burying the body and in 1997 the CWGC errected the headstone, assuming that the body in question was from the Jason. Good luck with the documentry. Hi, my father was on that ship, see below. Welcms to the Forum Patrick. From what you say he may have been aboard the Jason (Sebastiano Venier)which was torpedoed off point Methoni 9/12/41. The Jason has been discussed by the Forum in the past. After the sinking he would have spent some time in "Dysentery Acre" Greece before being transfered to Italy. Earlier this year we were contacted by a German Company who were making a Documentay about the incident. Not heard anything recently. A fellow Countryman of yours, Bernie Fiedlander I believe received the George Medal for getting ashore with a Rope. Hi, ref Berrnie Fiedlander. He is not listed in Dragons Can Be Defeated-A Complete Record of the George Medal. Just incase anyone decides to look him up.